Compared to fillings which just cover a small portion of a tooth, a crown (or cap) encases the entire visible portion of a tooth. In effect, the crown acts as the tooth's new outer surface. A dental crown is used when a tooth is broken or decayed to such an extent that fillings are unable to repair the problem. The crown is able to provide a protective shell around the damaged or decayed tooth to strengthen it, as well as to improve the appearance of the tooth. They can also help restore a tooth to it's original shape and are commonly used for teeth that have been broken. While crowns come in different materials, the most common crowns typically have some mixture of porcelain in them to give them a look and feel similar to a natural tooth. The first visit to your dentist involves reshaping the tooth and taking impressions to create the crown. After the dentist reshapes your tooth, he will use a special material to create an impression (or mold) of your tooth and the surrounding structures. This impression will be sent to a dental laboratory to be made into a permanent crown. Before sending you home, the dentist will provide you with a temporary crown to cover your tooth in between visits. When you return to you dentist, he will have received the permanent crown from the laboratory. He will remove the temporary crown and fit the new permanent one. Before cementing the permanent crown in place, he will ensure that it fits comfortably and matches the color of your teeth. Multiple visits may be required in order to check the fit and function following placement. 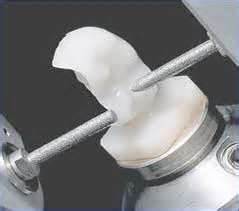 The Cerec crown system uses a computer to generate a custom fit crown from a block of porcelain. Since the crown is made while you wait you will not need to have a temporary crown or return on a different day for the placement of the final restoration as it will be seated on that same day before you leave. Unfortrunately these crowns are not reccomended for all teeth due to certain limitations, but through examination with Dr Tompkins they will be offered whenever possible in order to minimize visits as we know your time is valuable.